NEW! Introducing IndustrialMetallics, featuring our unique Carbon PerfectBooks and our NEW Mesh cover materials! Carbon materials have the same look and feel of carbon fiber, and are great for tech and commercial companies. Mesh materials have the look and feel of industrial fabric with a subtle sheen. 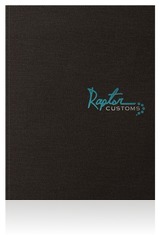 All feature Flex wraparound paper covers with perfect-bound spine.